Last week's workshop, Bookmaking Workshop: Build a Spirit Book, at the Berkshire Botanical Garden in Stockbridge, MA was great fun and a testament to the power of the internet for communication. There were twelve students in the class. Two were there because a friend in Arizona heard about my workshop from a mailing from me and recommended they take it. One was there because she saw my post about it on the Book Arts List. Another was a subscriber to Making Books Monthly, my email newsletter about making books with children. 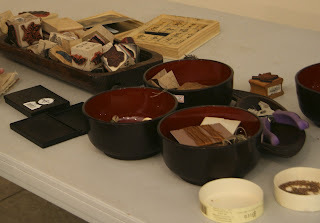 The students included experienced bookbinders and those with little or no book or art experience. I've offered the workshop in several different venues (gallery, women's retreat, book arts class) and time periods before, but this one at four hours seemed just right. We began with a powerpoint slide show about my work leading up to the Spirit Book Series tracing my work in calligraphy to the book form and the thread of connecting with nature. One of the reasons I like to show the progression of my work is because I started my life as an artist in my late twenties and came to it as a person without what normally would be considered art skills. I like to think I was a creative child but I have no innate drawing ability. I have a strong belief that everyone is creative and that creative work makes us more so. We were in a large and airy room with a perfect setup. The presentation was viewed in one part of the room; we then moved to another part for the bookmaking and there was plenty more room for tables of materials and a display of several of the Spirit Books. We had hoped to spend some time gathering natural materials but it was a rainy morning. The structure of the book we made was extremely simple: four fold and cut books that made four sections of the book which could be attached by gluing, stitching, or tying. A selection of materials (thread, beads, shells, wood, stencils, stamps, markers, textured papers) were there to complete the book. I like to set out the materials in a pleasing way and have collected bowls and wooden plates and containers at discount stores, thrift shops, and rummage and yard sales. With meditative music playing in the background (Breath of Prayers II by Wampanoag musician EJ Mills Brennan and Music in the Key of Om by Jack DeJohnette), the pace was relaxed and everyone seemed to feel good at the end. The Berkshire Botanical Garden has some art workshops in their extensive offering of garden related workshops. I made the connection through basketmaker Nancy Moore Bess who gave a workshop earlier this summer. Upcoming workshops include one on Ebru marbling and one on stone carving. There is also a garden-wide exhibition called Cultivate presented in collaboration with MASS MoCA which runs through Labor Day. We also discussed some bookmaking ideas for children for the annual Harvest Festival on October 4 and 5. I'll be giving a twoand a half hour version at the Art Complex Museum in Duxbury, MA in conjunction with the exhibition Artists and Books on October 26 from 1:30-3:30 pm. I just stumbled onto your blog, and I am so glad. I am an artist and a yoga teacher. Your workshop sounds wonderful. I take people on retreats, and one day, I would love to combine a yoga and art retreat. That would be amazing. I love your work! Book arts are incredible, and yours really speak to me. We were in the show "Vessel as Metaphor" together at the Nave Gallery. Thank you for your email/artletter pieces. I enjoy them. I'm currently, co-creating a book from an ongoing conversational blog. Eventually, I would like to make the finished piece an "art book" (that could, perhaps, be made into a few copies(non-identical). I would love to attend your workshop in Duxbury, but I am currently limited in funds and have become recently disabled which makes it difficult to drive this distance from Central MA. Anyway, I will keep it in mind. Let me know if others will be on the horizon and what the cost is.